2014 was an incredible year for female-fronted metal. There were so many excellent albums it was hard to keep up (and hard to pick just ten for my list)! 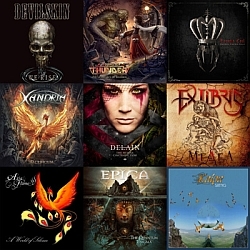 We had releases from lots of big bands (Within Temptation, Arch Enemy, Lacuna Coil, Epica, Delain, and more), as well as many excellent releases from newer and less famous bands. The large number of releases is reflected in the diversity of picks by the different SC staffers. We all love female metal, but our favorites are different. In fact, with ten staffers submitting lists, we have nine different #1 albums! Only Delain gets the nod twice. Other big news this year including The Pretty Reckless and In This Moment both debuting albums in the Billboard U.S. top ten; Alissa White-Gluz replacing Angela Gossow as Arch Enemy's vocalist; Doro celebrating her 30th anniversary with the Strong and Proud Tour; The Gathering performing their 25th anniversary show with Anneke van Giersbergen; Anneke, Liv Kristine, and Kari Rueslåtten uniting as The Sirens; Within Temptation releasing a DVD of their epic Elements show (Let Us Burn); and Helcanen Val announcing a one-year hiatus for the Metal Female Voices Fest after this year’s edition. The year also saw many great concerts and tours. Within Temptation and Delain toured together in Europe and then both toured North America separately (WT with Amaranthe and Delain with Sonata Arctica and Xandria). Delain also did their first two U.S. headlining shows. Arch Enemy toured North America with Kreator and is about to do the same in Europe. Lacuna Coil also toured North America, and Epica planned to do the same but was foiled by Machine Head cancelling the tour. Lindsay Schoolcraft toured with her new band Cradle of Filth, and the Milwaukee Meowsic Fest featured some of North America’s best talent, including Aria Flame, Grace Méridan, and Kassandra Novell. Meanwhile, in Europe, it was another amazing year of festivals like Wacken (with Arch Enemy), Summer Breeze (with Anneke van Giersbergen, Arch Enemy, and Delain),M'era Luna (with Within Temptation), Dames of Darkness (headlined by Stream of Passion and Xandria), and of course MFVF (headlined by Therion and Leaves’ Eyes). With a year like that, one might fear that next year will be a dud. But have no worry, we can expect new releases from Nightwish, Battle Beast, Halestorm, and more. Plus, Nightwish has announced a North American tour with Delain. But for now it’s time for the 2014 lists. Our staff have once again compiled personal lists of their favorite female-fronted metal and rock albums of the year. This year we also decided to move up our list to the beginning of December, to make it useful for Holiday shopping. Hope that helps, and if we miss any year-end releases we’ll try to include those next year! 3. Dawn of Destiny – F.E.A.R. Also expecting a Blackthorn release in December that would, no doubt, have made the list.